Remodeling Your Bathroom - Where to Start? The prospect of a new bathroom is enticing, but transforming your vision into reality requires some preparation. Following some simple but important guidelines will put you on the path toward realizing your dream. Define who will be using the new bathroom and what their needs are. Guest baths and powder rooms need only the basic amenities, but a master bath deserves more. It should be an oasis, a luxurious retreat from the stresses and intrusions of daily life. To determine what you should spend, consider how long you plan to remain in your home. If it's 10 or more years, you can make a serious investment. Should financing be necessary, figure out how much additional monthly debt you can afford. Factor about 30 percent for labor costs, plus 10 percent of that to cover change orders or last-minute problems. The National Association of the Remodeling Industry (NARI) provides a helpful online budgeting worksheet at http://www.nari.org/. How do you want your bathroom to look? Create an idea book with photographs from design magazines or product web sites, or take a mental inventory of bathrooms you have admired in other people's homes or even hotels. Manufacturer websites are a good source to find their products in room settings. A designer can help you with experience. In the end it is your bathroom so make sure it is what you are going to like. Keep your financial homework close at hand and use it to track expenditures against budgeted amounts. You'll be less likely to authorize expensive change orders if you know you are within your spending limits. Allow some flexibility. If you have your heart set on a deluxe spa tub, for instance, it may be worth forgoing real marble counter tops in order to balance your budget. The Faucet Expert™ from eFaucets®.com recommends working with your contractor to install all the costly items out of your expertise such as rough plumbing, tile work, cabinets, and granite countertops. Shop online for all the Lighting Fixtures, Faucets and kitchen & bath accessories. Ask friends and associates for references. Check the ratings/reviews section of online referral services such as ServiceMagic. Interview at least three professionals and show them your idea book before making a decision. Talk candidly with your designer about your budget, preferences and concerns. Contractors and designers should bear these in mind during the design process. Experienced professionals are equipped with an arsenal of techniques and strategies for satisfying champagne tastes, even on a beer budget. If you aren't using a designer, ask your contractor to review your ideas before ordering fixtures and materials. Ask for feedback about how your design would impact the cost of installation. For example, relocating plumbing fixtures costs both time and money. Keep on top of the project until it is complete. It's the best way to stay on track, under budget, and on top of any unexpected issues as they arise. Get any changes in writing up front to avoid hidden change orders. Work with your contractor every step of the way to ensure it is being done the way you desire. You dont want to change things after the work has been done. Communication is key. Always remember that the contractor is the one doing the manual labor. You are still the boss, the client and the one that needs to be satisfied when the job is done. This article is sponsored by Jacuzzi. Bathtubs & Hot Tubs - Innovation! Jacuzzi® is the leading global manufacturer and distributor of bath products for the residential and commercial markets. Known world over for quality products and innovative technology, Jacuzzi launched an industry with the first self-contained jetted hot tub. Today, Jacuzzi offers luxury product lines of Jacuzzi bathtubs, walk in bathtubs, showers, sinks, and hot tubs for every style and budget. Backyard or bath, the Jacuzzi name stands for beauty, versatility, and excellence. eFaucets.com is the leading online retailer of Jacuzzi Tubs and bath products. The Slipper Clawfoot Tub features a contoured end that flares up behind the head position on the opposite side of the tub filler faucet side. The Slipper Tub style is more designer and luxurious which makes it a little more expensive then the standard flat clawfoot tub. The contoured end is perfect for supporting your head while you lay back and relax in a classic bubble bath. You can also find Double slipper clawfoot tubs which contour up on both sides of the tub. This adds style and is perfect for when two people want to share a romantice bath experience. So many options to choose from. 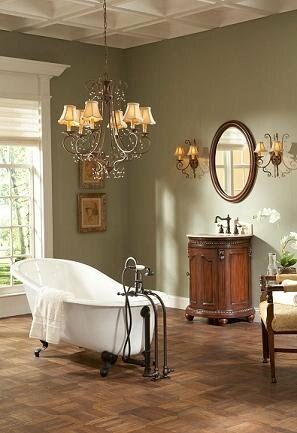 Cast Iron tubs are the classic choice and die hard Victorian fans will settle for nothing less. However, cast iron tubs are pretty heavy and can on average weigh between 200 - 400 lbs. Add water and 1 person and you have a pretty heavy tub sitting on your bathroom floor. You will want to review whether your floor can support it escpecially in an older multi-story residence. Cast iron is also pretty expensive these days which makes these tubs range between $2,000 - $8,000 full retail. Acrylic clawfoot tubs are the new alternative solution to classic tubs. The look the same but are much lighter and far cheaper to produce. Some are so light weight that one person can lift them and they may only start at a few hundred dollars. The Faucet Expert recommends Elizabethen Classics as its top seller of Classic clawfoot Tubs. With Elizabethan Classics Bathtubs you'll find everything you need to complete the bath of your dreams. Classic cast iron clawfoot tubs, acrylic clawfoot tubs, bath faucets, Victorian-styled water closets, pedestal lavatories and console lavatories all inspired by the days when style was warm, comfortable and appealing with just a flourish of understated sophistication. This elegant collection perfectly captures the charm of the past -- a more relaxed, slower -paced, romantic time. Elizabethan Classics Collection is as timeless in design as it is sound in function. Indulge yourself in the best of both worlds - beauty and luxury, with the convenience of modern day innovation. We all deserve a private place where we can relax in comfort, let go of tension, recharge our batteries and emerge refreshed and energized. Many busy homeowners are remodeling their bathrooms into a retreat where they can daydream, read, listen to music or socialize. If your ideal home spa isn't complete without a whirlpool bathtub, you can find one in virtually any shape, size and color. Amenities include such features as air flow adjustability, quiet motors, control panels, heated liners and even underwater lighting systems. The latest models are also equipped with adjustable jet systems that can target specific areas to soothe tight muscles and aching joints. A popular alternative is the air bath, which uses millions of effervescent bubbles to create a delicate curtain of heated air that rises through the water. The result is a gentle, soothing experience, more of a caress than a massage. Unlike in standard whirlpools, salts and aromatic oils can be used in an air bath. For the best of both worlds, choose a combination water retreat such as Jacuzzi's Salon Spa, which can deliver the therapeutic benefits of a whirlpool or the calming effects of an air bath. Steam showers, too, have evolved into multi-faceted systems and have become a popular key element in transforming bathrooms into a complete spa. To transform a standard bathroom into a luxurious oasis, think beyond the water features. Design elements such as cabinetry, color, light, sound and your choice of flooring - slate, marble or natural tile, for example - also shape the spa experience. Accessories run from the merely functional (non-misting mirrors) to the indulgent: radiant heated floors, towel warming drawers, even a fireplace. Now ask yourself: What really makes your mornings hum, your evenings purr? 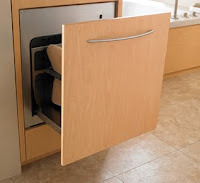 If you love starting your day with hot coffee or cold fruit juice, put in an instant hot water system or a mini-fridge. Want to get the latest headlines without retrieving the newspaper? Install a remote-control television like Jacuzzi's Lift It TV Lift System, which brings the set up from its cabinet whenever you want to watch the news. For a perfect evening, put on a CD, pull out a bottle of chilled wine, and slip into a tension-relieving whirlpool bath. Or opt for a calming air bath enhanced with aromatic salts and chromotherapy, while surround sound adds another cushion of comfort as the cares and demands of workaday life float far, far away. What could be more comforting then a warm, fluffy towel or cozy warm slippers waiting for you as you step out of the bath? Introducing the Jacuzzi Towel Warming Drawer. Bring Spa-like luxury home with Jacuzzi's stainless steel warming drawer that slips into standard cabinetry and warms up to two towels in minutes. 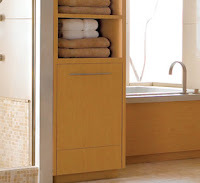 Or opt for the larger 42" version that accomodates up to 4 towels, or bathrobes and oversized bath sheets. Two-hour automatic shutoff, stainless steel construction, Factory pre-set temperature, uniform movement of air, Dry fresh nice and fluffy towels at any time, prevent mildew from wet towels, Energy efficient, Maintenance free. Multiple uses - also warms slippers, robes, baby blanks, and quilts. A great place to dry delicates such as lingerie. 12 volt 15 amp, Double wall robust construction, Warms up to 120°F. The Faucet Expert recommends Jacuzzi products from eFaucets.com, the leading online retailer of Jacuzzi Tubs, Jacuzzi bathtubs and Jacuzzi Towel Warmers.